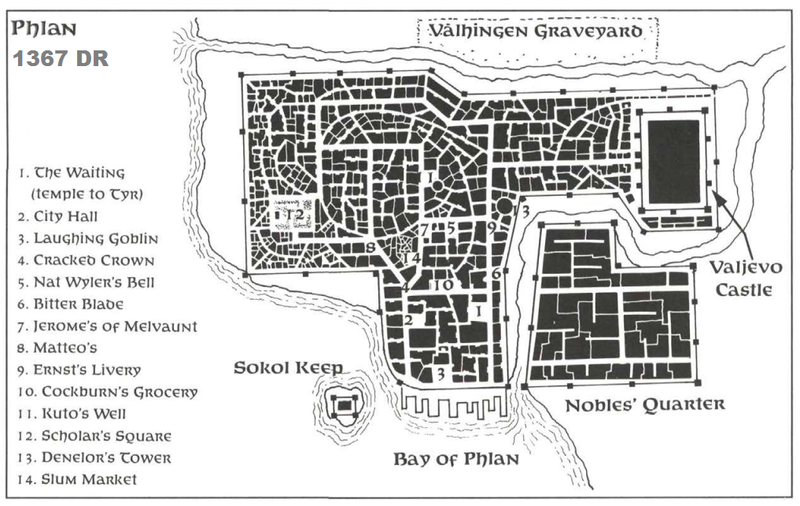 The City of Phlan is a port city on the shores of the Moonsea. Its history is marked by continuing cycles of destruction and rebuilding. As of 1489 DR, it has a population of around 18,000, plus 2,000 in outlying farms and homesteads. Main article: History of Phlan. Phlan was founded in 367 DR (about 1100 years ago) as a trading outpost between elves and dwarves, but it was destroyed shortly thereafter during the First Turnabout. In 712 DR it was rebuilt by Milsor the Valjevo, and stood as a major power on the Moonsea until the Dragon Run of 1306 DR, when it was laid waste by dragons. The period that follows, known as the age of Ruined Phlan, saw the city split in two. A small enclave of order, known as Civilised Phlan or New Phlan, centred around the docks, was home to a small outpost dedicated to retaking and rebuilding Phlan. It was led by the Council of Ten and supported by the priesthood of Tyr. Meanwhile the ruins, also known as Old Phlan, were ruled over by the demon Tyranthraxus. In 1340 DR Tyranthraxus was slain, and within the next few years Phlan was once again recognised as a civilised city. In 1350 DR, the city was briefly teleported from its normal location by the dark god Bane as part of one of the dark god’s plots, but Bane was thwarted and the city returned to its usual place. Phlan was conquered by[[Zhentil_Keep?]] in 1375 DR. The leader of the conquering force, Cvaal Daoran, installed himself as ruler of Phlan and gave himself the title of Lord Protector. He used his personal bodyguard, the Black Fist, to enforce order. His rule was initially tyrannical but over time it softened. Cvaal Daoran was succeeded by his son Talaric, and then by his grandson Anivar. In 1488 DR, Lord Protector Anivar Daoran was killed in a construction accident while overseeing renovation of Valjevo Castle. With no clear heir, rulership was assumed by Ector Brahms, commander of the Black Fist, who took the title of Lord Regent. In the resulting chaos, trade has declined, martial law has been declared, and tensions have risen throughout the city. The current year is 1489 DR.